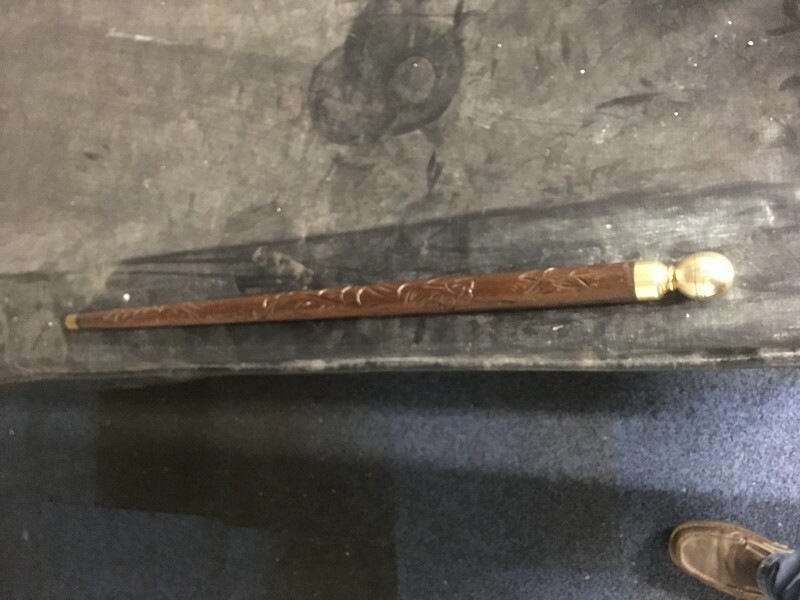 A little while ago, Dad appeared bearing what appeared to be a walking stick... which is also a snooker cue! Crafty! 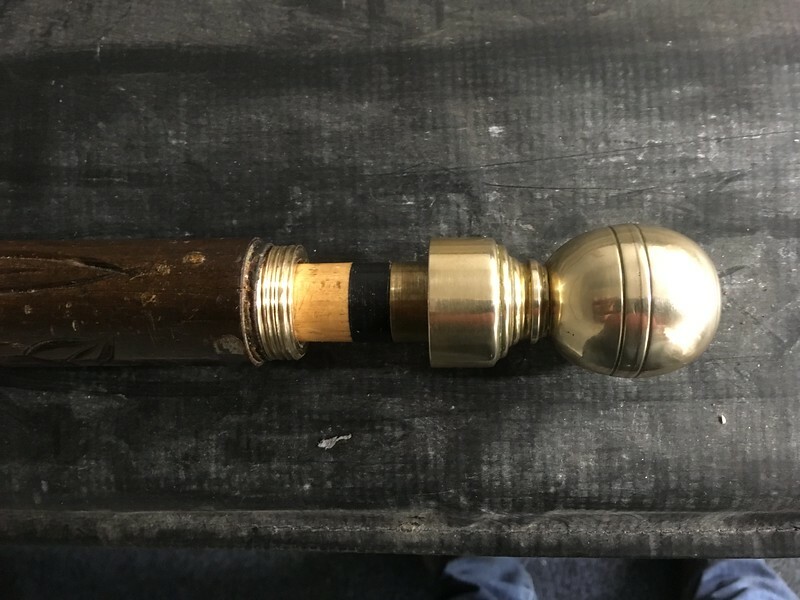 Unfortunately, the brass knob which screws onto the end of the walking stick (when it's a stick) or cue (when it's a cue) no longer screwed on, as the wooden threads on the outer shaft were gone. The solution was to turn a brass insert, which replaced the old wooden threads. The insert was also threaded on the other end, and a tap (1" British Standard Fine fit nicely) shoved down the hole to more-or-less cut some threads inside the cue/stick body. The insert was then hollowed out to allow the cue tip and bottom end of the shaft to pass through it. 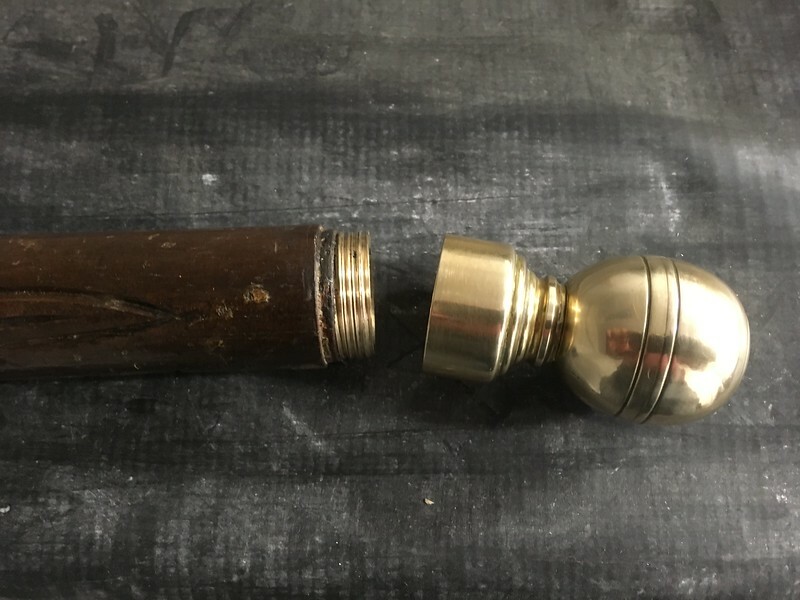 Although the threads in the wood gripped surprisingly well, the ones on the brass knob gripped a bit better; so a blob of superglue was added to the insert which was then screwed in and allowed to set. A few minutes later - one working cue/walking stick! I'm afraid I've got no "in process" photos (the brass was cheesing me off to the point I forgot t get the camera out), so only a few photos of the finished article. Just need a rubber "bumper" now to finish it off. Although as Dad is taller than me (5"19'), and I find the stick to be too short to be a walking stick, I expect I'll be turning up an extension piece soon! The brassy bit is the bit I made. It's all a bit hokum, there's no precision engineering here. The thread angles are all wrong, I cut it using a hopeless tool which cuts different angles on each side of the thread... but as the old ones were wooden, I had plenty of leeway. 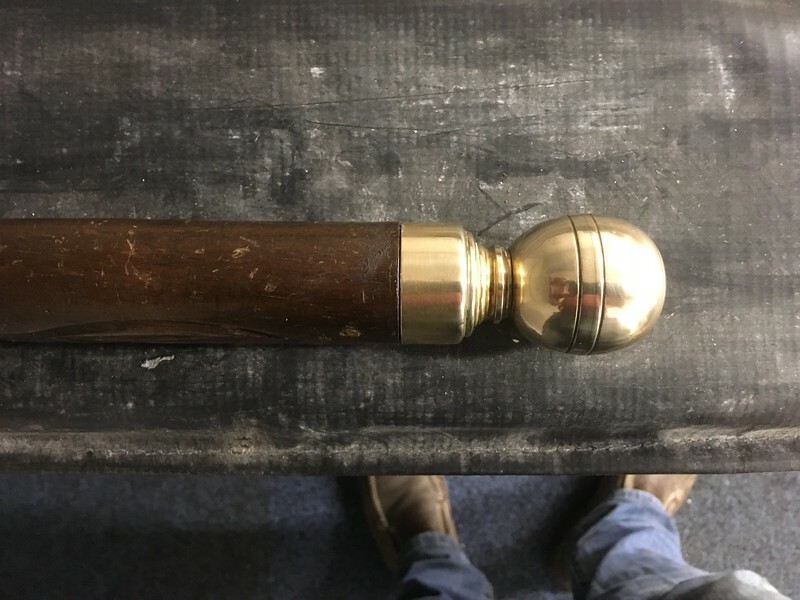 Once the cue is unscrewed from the brass knob, the knob is screwed back on "empty" (actually, the rubber foot would be screwed onto it, if it were present), and it's screwed back onto the end of the stick to counterweight the cue. Incomprehensibly, I didn't take a picture of the stick in full cue mode... I'll do that tomorrow. Might even christen it on the office pool table! Single-point threading to a shoulder is an arse-puckering experience on my lathe, which has an almost non-functional brake... However, I used a tip picked up from one of Joe Pieczynski's videos - https://www.youtube.com/watch?v=Z-dqOi_z5bk - which saved a whole load of worry, AND let me thread at the sort of speeds that would be impossible if approaching a shoulder or the chuck. Nice repair and your Dad must be Happy. I have also used Joe Pieczynski's lathe threading technique. It sure make threading to a shoulder much more relaxing.